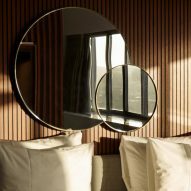 Space Copenhagen has re-introduced original features and furniture as part of a comprehensive refurbishment of Arne Jacobsen's iconic Royal Hotel, which is nearing completion in the Danish capital. The project involves the renovation of 259 guest rooms and suites, the lobby and meeting rooms, as well as the introduction of a new restaurant at the hotel, which originally opened in 1960. The building designed by Danish architect and designer Arne Jacobsen for the airline Scandinavian Airlines System (SAS) was Copenhagen's first skyscraper, and is one of the most familiar and celebrated examples of Danish modernist architecture. 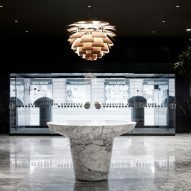 Now known as the Radisson Blu Royal Hotel, it is also famous for being Jacobsen's gesamtkunstwerk – a project where he oversaw every aspect of the design, from the architecture to the furniture, and even the cutlery used in the original restaurant. 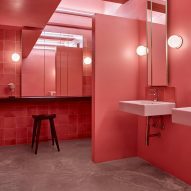 The redesign by Space Copenhagen – a studio established in 2005 by Signe Bindslev Henriksen and Peter Bundgaard Rützou – seeks to modernise the interior while celebrating the existing spaces. 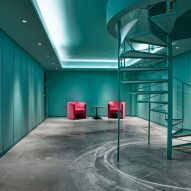 "The hotel is a true landmark for design aficionados around the world," said Bundgaard Rützou and Bindslev Henriksen. "Our intention is to preserve its extraordinary character, but we don't want to turn it into a museum – we want to bring it to life for a new generation." Many of the hotel's original features and furniture are reintroduced in the new interior, including examples of the Egg chair, Swan chair and Drop chair, which Jacobsen designed for the hotel. 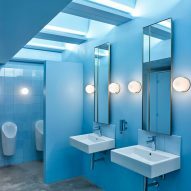 Space Copenhagen worked with the manufacturer of the furniture, Danish brand Fritz Hansen, to update the pieces using fabric from Kvadrat's range with the designer Raf Simons, and combined these classic designs with a new mirror and chair it created for another Danish firm &tradition. 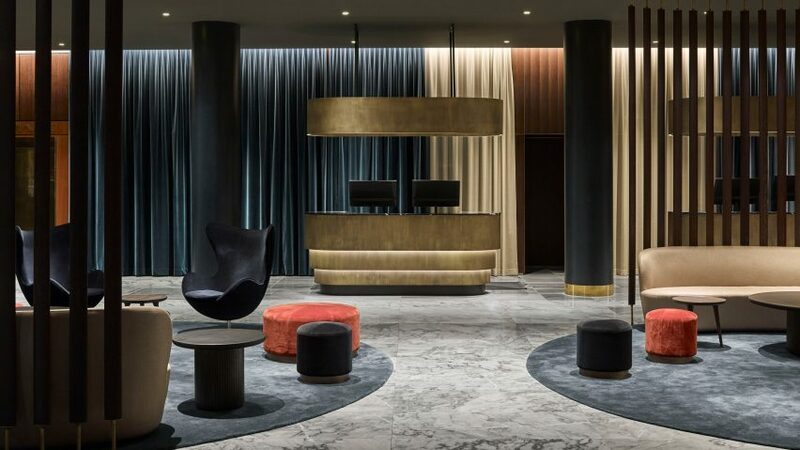 The furniture takes pride of place in the refurbished lobby, where the architects removed an existing bar and retail space to give greater emphasis to the reception desk and create new areas for guests to relax or work. Original marble floors have been reinstalled across the ground floor, alongside wood and marble wall panels. The space was opened up to create a seamless flow between the lobby and the restaurant and bar, with floor-to-ceiling wooden screens used to create subdivisions. 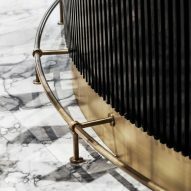 A suspended spiral staircase that is one of the most recognised features of the original interior design has been restored by re-introducing details such as leather-wrapped handrails. An illuminated halo suspended from the ceiling on the mezzanine floor above the staircase introduces a contemporary element that accentuates the drama of this space. The hotel's guest rooms aim to make the most of light and views provided by the horizontal bands of windows wrapping the building. The architects re-introduced deep marble windowsills to emphasise the transition between the room and view. They also developed the Amore Mirror series, which are used inside the rooms to echo the horizontal sequence of windows. The rooms are intended to be warm and homely, with upholstered beds and furniture including the Fly Sofa designed for &tradition complementing Jacobsen's original pieces. 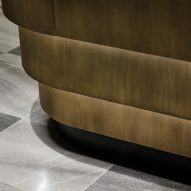 The restaurant and bar on the ground floor have been redesigned to create a more informal atmosphere, featuring flexible seating and less known Jacobsen designs such as the Mayor sofa and Giraffe dining table. Nine meeting rooms on the first floor aim to provide warm and formal spaces with a domestic feel. The rooms are furnished with the restored Egg and Swan chairs, which introduce colour and texture to the otherwise muted interiors. Currently, the renovation of the lobby, bar and restaurant, meeting rooms and a number of guest rooms is complete, with the remaining guest rooms and additional renovations set to be finished in spring 2018. Photography is by Joachim Wichmann.